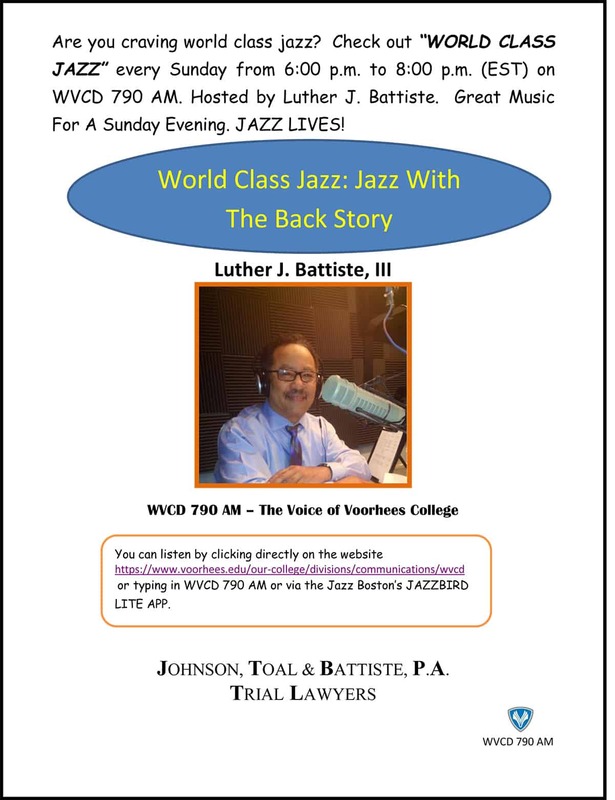 I am delighted to inform you that “WORLD CLASS JAZZ” will start this Sunday January 6, 2018 on WVCD 790 AM. This is the Voorhees College Radio Station. I will be reunited with Professor Clarence Jones who was the engineer on the previous show I hosted and is the General Manager of WVCD. The show will be known as “World Class Jazz.” I will be on the air each Sunday from 6:00 PM TO 8:00 PM EST. The show will be accessible via the internet and JAZZ BOSTON has again selected the show for inclusion on its international network. The poet Nikki Finney saw me recently and said “Hi Jazz Man.” I like that. I hope to be your Jazz Man each week. JAZZ LIVES!